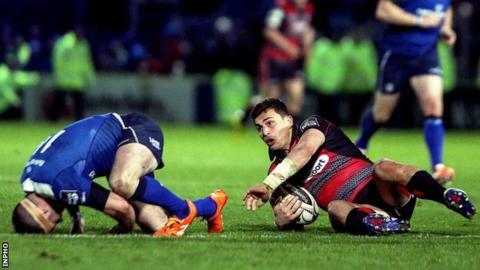 Pro12 leaders Leinster had to battle before clinching a bonus-point win over a brave Edinburgh side at the RDS. After being 6-3 up at half-time, a Luke McGrath try extended Leinster's lead only for Tom Brown to quickly reply. Josh van der Flier was gifted a try by Sean Kennedy before a Fergus McFadden score extended Leinster's lead to 25-8. Ian Madigan's mistake allowed Mike Allen to reply but after McFadden scored his second try, Kennedy's score left Leinster hanging on. Edinburgh lost centres Chris Dean and Phil Burleigh to injuries at half-time and, despite having to play several players out of position in the second period, fought back impressively to earn a losing bonus point. Indeed, the visitors went in search of a converted try in the closing stages and Leinster wing McFadden looked fortunate to avoid at least a yellow card for a high tackle on Edinburgh's Damien Hoyland. Leinster unsuccessfully attempted to bludgeon their way through a dogged Edinburgh defence in the first half and only had two Madigan penalties to show for their efforts, with Tovey scoring at the other end. A brilliant Luke Fitzgerald break set up McGrath's 43rd-minute score but Tovey's superb looping pass set up Brown to reply in the corner within two minutes. However, Tovey's missed touch from a penalty on the Leinster 10-metre line and Kennedy's woeful pass gifted Leinster a try almost immediately as Van der Flier ran in unopposed. McFadden finished off a period of Leinster pressure to extend the lead to 25-8 in the 58th minute but Madigan then gift-wrapped a try to Edinburgh as former Ulster wing Allen read the Ireland fly-half's inside pass. A second McFadden try on 63 left Leinster 30-15 ahead but Edinburgh dominated thereafter with Kennedy scoring on 70 before Sam Hidalgo-Clyne's penalty left only seven points between the teams with five minutes left. Leinster's win moves them five points clear of Connacht in the table while Edinburgh edge above Munster into the sixth spot, which would be enough to secure a European Champions Cup place.